Margarita Machine Rentals 214-484-2489. Margarita Machine Rentals in Dallas Tx. Rent a Margarita Machine for your next event. Serve up a refreshingly cold treat to your guest. 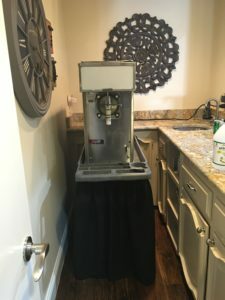 Great for making Margaritas, slushies, and mixed drinks, this machine allows you to serve a variety of fun cold treats. Its design holds 1.5 gallons that is constantly replenished by a 5 gallon storage tank. We have been serving all the Dallas DFW area for more than 10yrs. Our Margarita Machine are commercial graded. How to rent a Margarita Machine for your next party in Dallas Tx.? Give us a call to make your reservation for your Margarita Machine Rental. Where to rent a Margarita Machine in Dallas? We are located in Richardson Tx, but we can deliver any where in the Dallas DFW area. Do not use Extension Cords. Plug in directly to power outlet. Give us a call 214-484-2489 to help you choose the right Margarita Machine Rental option for your special event in the Dallas Tx DFW area. We deliver to the following cities : Dallas Tx., Plano Tx. , Prosper Tx., Addison Tx., Balch Springs Tx., Carrollton Tx., Cedar Hill Tx., Cockrell Hill Tx., Coppell Tx., Dallas Tx., DeSoto Tx., Duncanville Tx., Farmers Branch Tx., Ferris Tx., Frisco Tx., Garland Tx., Glenn Heights Tx., Grand Prairie Tx., Grapevine Tx., Highland Park Tx., Hutchins Tx., Irving Tx., Lancaster Tx., Lewisville Tx., Mesquite Tx., Richardson Tx., Rowlett Tx., Sachse Tx., Seagoville Tx., Sunnyvale Tx., University Park Tx., Wilmer Tx. and Wylie Tx..